Last summer I built a double X bench out of 2×4’s and 2×3’s, I love it and it fits perfectly on my front porch. When drawing up the plans for that bench I was trying to keep with the look of an inspiration piece and some of the build was unnecessarily tricky without an extra pair of hands. 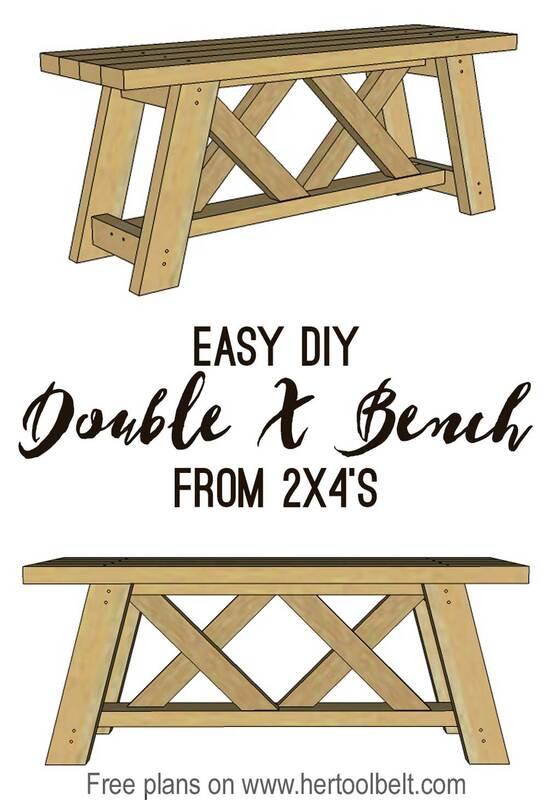 Also if your 2×4’s have a little twist in them, there was no way to correct that and you could end up with a rocking bench. Here is round 2 of the Double X Bench made from 2×4’s and 2×3’s, it’s easier to assemble and doesn’t require a pocket hole jig. If you went to SNAP 2017 this is the Let’s Get Building class project that was sponsored by Ryobi Nation. Make all of the board cuts from the cut list. I like to sand all of my boards now before assembly. 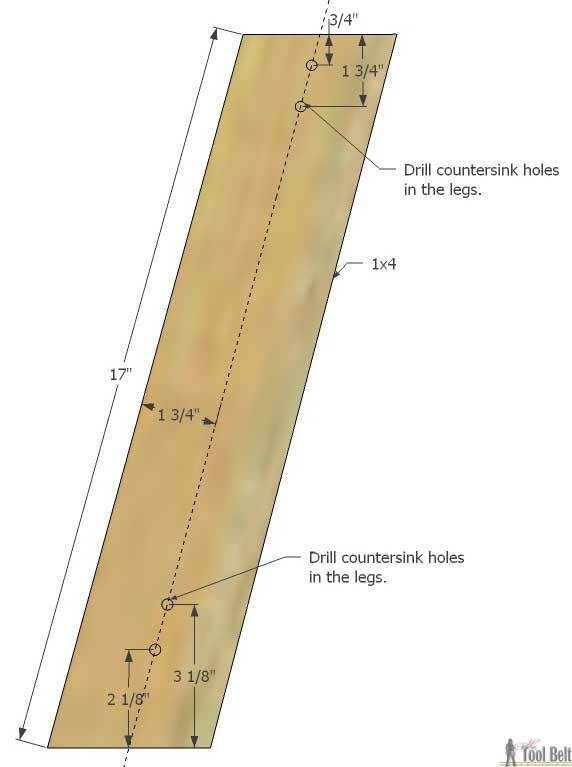 To make assembly easier, measure and mark locations for countersink holes. A countersink hole will allow the screw head to be flush with the wood surface. Measure and mark the following locations and drill countersink holes, only drill the countersink deep enough to take the screw head. 2 legs will be as shown and 2 legs will be mirrored. On each spacer mark 3 1/2″ and 5 1/2″ from an end and 3/4″ from the bottom. Drill 2 countersink holes in spacer. Mark the center of each spacer (opposite side from the countersink holes) and mark the center of the upper and lower bar ends. Place a spacer on each end of the bars and line up the center marks. Use wood glue and 3″ wood screws to attach the spacers to each bar end. Place the upper bar (the short one) on a flat surface, add wood glue on each spacer end. Place a leg on each side of a 9″ spacer and offset the leg 1/2″ as shown. 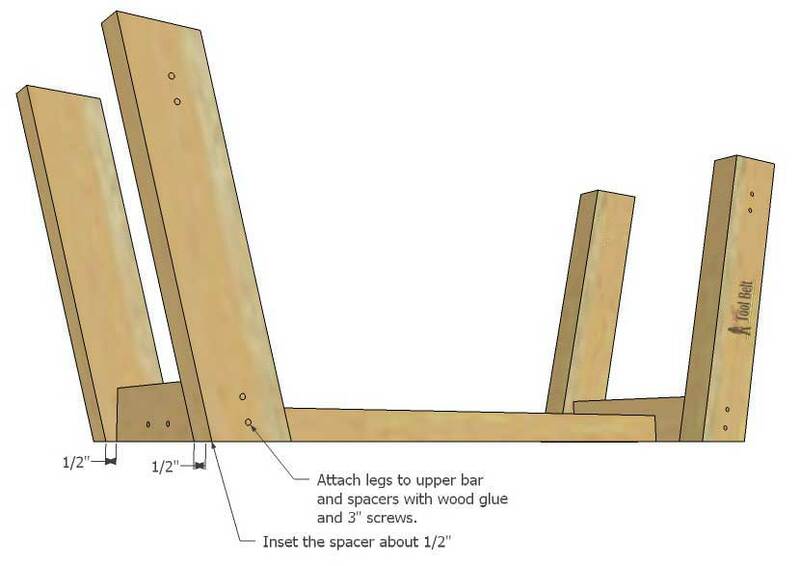 Use a bar clamp to hold the legs in place and secure the legs to the spacer with 3″ wood screws. Repeat for other leg set. Screw 3 of the legs into place. Flip the bench over and place on a flat surface. Put the 4th leg in place so there is no rocking, hold with the clamp and secure with 3″ screws. Mark the center of the upper bar. Add wood glue to the ends of the X pieces. Put an X piece on each end of the upper bar and inset 1/4″ from each side, tack the end of the X pieces with 2″ brad nails. Place the other 2 X pieces on the center-line of the upper bar and inset 1/4″, tack the ends with 2″ brad nails. Put the lower bar evenly on the X pieces and between the legs. Center the lower bar and use the clamp to hold in place. Attach the legs to the lower bar spacers with 3″ wood screws. Secure the X pieces through the lower bar with 2″ brad nails or screws. 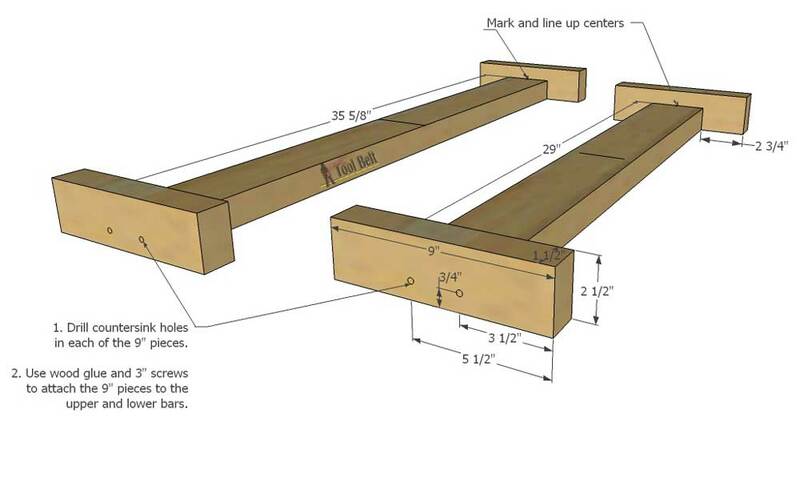 Measure and mark 6 3/4″ from each end of the top boards and the center (1 3/4″). Drill countersink holes in each top board. 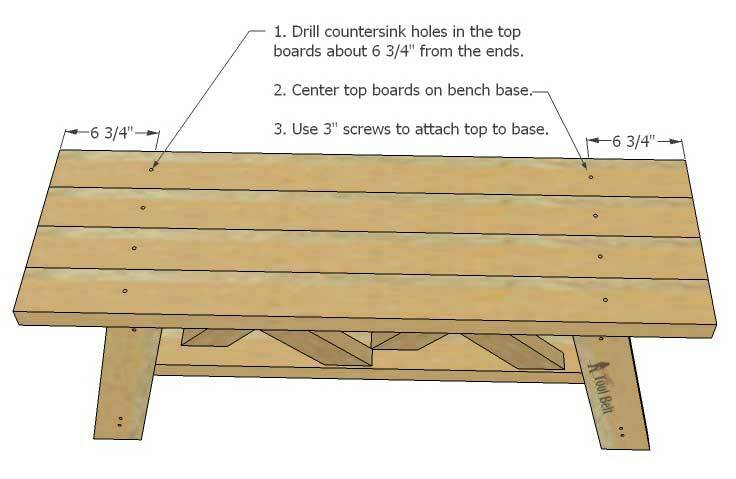 Center the boards on the bench base and use 3″ wood screws to attach the top boards to the base. Sand the bench with 80 grit and finish with 120 grit sanding in the direction of the grain. Stain or paint the bench as desired. Add a top coat for additional outdoor protection. Do you know what the total cost of lumber is? lOVE THIS! Thanks for the plans. Hello! Love you bench. 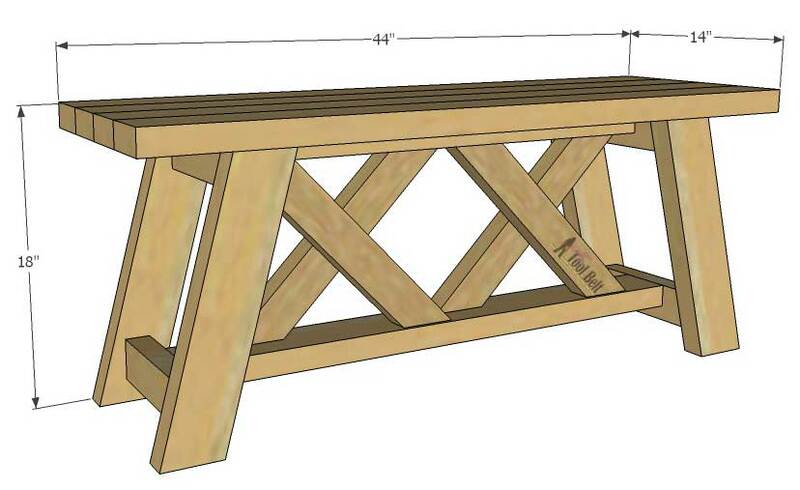 How would we go about cutting up for a 3 foot bench (36 inches)? I LOVE this little bench. I made two all by myself. I absolutely LOVE this bench! I was wondering how difficult it would be to add 1 more X to create a longer bench? Have you ever created one like this? Thanks for your expert direction. I’ve seen a few people make the bench longer and add an extra X, it looks cute. I’ve made 2 of these easy to build benches thanks to your instructions. I have been asked to make a 6’ table to replicate this design. I’m excited to try this and will let you know how it turns out!! Thanks again! Awesome, I bet it’ll turn out great! Quick question. Should I use pressure treated wood instead or is the stain/paint good enough for weathering protection? Mine has been on the porch (mostly protected from rain and snow) for a few years and been fine with paint. If you’re going to have it out in the rain and snow, you may want to use pressure treated. Are the “X’s” attached in the middle (of each “x”)… or just at the ends? Just at the ends, although you can do the middle if you want.